As we all know, the buildings of Shanghai Mansion and People’s Bank of China are both artistic and comfortable, but actually most of these characteristics benefit from a new type of building material --- aerated concrete block. Today, we will study together how this new type of building material can be connected with MTW euro-type Mill. Apart from such famous buildings as Shanghai Mansion, the construction of many schools and residence begins to adopt this new material. For example, the aerated concrete block to be discussed in this text is featured by light weight and thermal insulation, which has been widely applied into industrial and civil architecture. It has been called the most mature wall material for production and application technology by now. The rise of aerated concrete block is inseparable from national ban on solid clay. In order to boost house industry modernization and improve residential quality, large and medium-sized cities in coastal areas and municipalities will prohibit the use of solid clay. Besides, such characteristics of it as light weight, thermal insulation, sound insulation and anti-seismic help bring about higher market demands. When applied in high-rises, it can improve the shortcomings of traditional solid clay buildings to the uttermost, thus bringing good living experience to residents. At the production site of aerated concrete block, we can see, after being measured respectively, the raw materials for aerated concrete production, such as cement, gypsum, lime, coal ash and sand will be stirred together with such additives as powdered aluminium and water by storage, crushing or grinding to the respective storage warehouse. After stirring, the material enters the stop system for gas expansion & body maintenance and then is to be incised according to production needs. Autoclaved curing is then carried out in the steamed kettle; finally it is to be packed for use. According to engineers, this is just a part of aerated concrete block production. To ensure the produced aerated concrete blocks possess such good performances as thermal insulation and anti-seismic, the fineness of materials is also very important besides proportion of raw materials and manufacturing technique. Generally speaking, there are strict fineness demands on lime, coal ash and powdered aluminium used for aerated concrete blocks, such as lime --- 180-200 mesh, coal ash --- 325 mesh and powdered aluminium --- 200 mesh. To satisfy material fineness demands on blocks, MTW euro-type mill is to function now. Taking the lime processing for example, the calcinated quicklime firstly goes through jaw crushing and then enters the surge bunker by elevator; the bulk material in the bunker then enters the inside of the main engine through vibrating feeder. 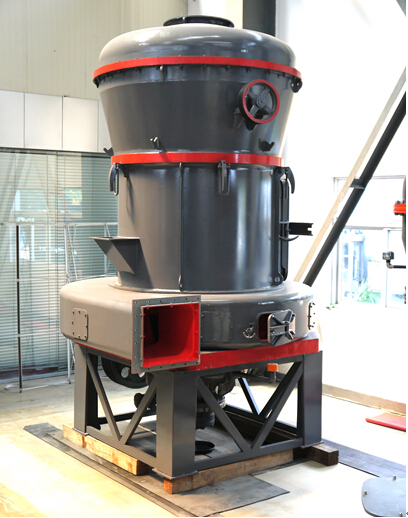 After the grinding of MTW main engine and screening of powder concentrator, the bulk materials finally enter the powder collector to collect powder, which enters the aerated concrete block storage vessel for spare use by elevator or pneumatic conveying equipment. The powder process of other production materials, including coal ash and gypsum is similar to that of quicklime. So, MTW Euro-type Mill is the most up-to-date grinding machine launched by Shanghai Zenith based on long-term flour production experience，which features high efficiency, low costs, low energy consumption and less space occupation. Its application into powder grinding of aerated concrete blocks has many mature production cases, which have received recognition of customers at both home and abroad.